Nicasio Valley Pumpkin Patch is back this fall season with a new name (it was formerly called Nicasio Valley Farms Pumpkin Patch) and plenty of fun for everyone in the family. Located in the small west Marin village of Nicasio, the farm is just west of the Nicasio Village Square right on Nicasio Valley Road. Nicasio Valley Pumpkin Patch is open seven days a week through Halloween from 10 am to 6 pm, and it's always worth a visit. 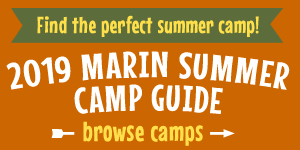 It's been a Marin County tradition for over 20 years! Nicasio Valley Pumpkin Patch offers a wide variety of pumpkins spread out in an expansive meadow on the farm. Pumpkin varieties ranged from your standard Halloween jack-o-lantern types to white ones, green Italian and Australian varieties, and flat European "Cinderella" style squash. The farmstand also offers of gourds, squash, and decorative cornstalks, apples, as well as drinks and snacks. Pumpkins range in price from $5 to $40. Like many Halloween pumpkin patches, Nicasio Valley offers the obligatory jumpy houses and inflatable slide. There are also hay rides, pony rides, a petting zoo, farm animals to visit, a climbing wall, henna tattoos, and face painting. Some of these attractions have an admission fee, and some are available only on weekends and select days. Other fun includes a couple straw bale mazes for kids to get lost in—don't worry, they're not difficult to figure out, so nobody's really going to get lost. There's also a real effort to make your trip to the pumpkin patch a real educational experience. There are educational exhibits and activities, including informative placards from the Marin Agricultural Land Trust (MALT) placed throughout the farm. The rural Nicasio setting is, as always, breathtaking. There's an expansive shaded seating area with picnic tables, straw bales, umbrellas, and tents, so you can relax and take in the scenery, listen to some great live music, and even eat lunch. If you arrive hungry, food vendors will be on site on weekends. You can also enjoy some live music at the pumpkin patch on weekends. Look for Marin's favorite children's musician and recording artist Tim Cain performs on Sundays from 11 am to noon and the fantastic local country/Americana/roots-rock band Manzanita Moon performs Saturdays and Sundays from noon to 4 pm. Sunday, October 21 is MALT Day at the Pumpkin Patch, which will feature all sorts of food, children's games and crafts, local cider, farm animals, and educational booths where you and your family can learn about the role of agriculture in Marin County. A portion of pumpkin sales that day will support MALT. MALT Day takes place from 11 am to 3 pm, and admission is free. We always have a great time at Nicasio Valley Pumpkin Patch, which is one of the reasons we've been coming here each fall for years. It's an unbeatable experience here in Marin, in a place that easily accessible from almost anywhere in the county. It's a must-visit Marin destination in the fall. For more information, call them at (415) 662-9100 or visit www.nicasiovalleyfarms.com. After our pumpkin patch visit, we stopped in at the Nicasio Valley Cheese Company (located next door near the parking lot), run by the Lafranchi family, who also put on the pumpkin patch. My kids love cheese of all kinds and had a great time trying all the different kinds of certified organic cheeses that are crafted on site. Their new Locarno brie-style cheese is one of our favorites! To get to Nicasio Valley Pumpkin Patch from northern Marin, take 101 to Lucas Valley Road. Head west on Lucas Valley Road until you get to Nicasio Valley Road. Turn right onto Nicasio Valley Road and follow it through the village of Nicasio. Nicasio Valley Pumpkin Patch will be on your immediate right as you head out of the village. You can also take Novato Boulevard west to Point Reyes-Petaluma Road. Turn left on Point Reyes-Petaluma Road and follow it until you get to Nicasio Valley Road. Turn left onto Nicasio Valley Road and follow it to Nicasio; you'll see the pumpkin patch just past Nicasio School. From southern and central Marin, take Sir Francis Drake Boulevard west to Nicasio Valley Road. Turn right onto Nicasio Valley Road (at San Geronimo Golf Course) and follow it until you get to Nicasio. Parking is in a small lot near the farm entrance, along Nicasio Valley Road, and in an overflow lot behind the farm. Try to get there early, as this pumpkin patch is extremely popular! Restrooms are available in the form of port-a-potties with outdoor hand-washing stations. The picnic area has plenty of shade, but hats and sunscreen are a must. Make sure you wear something you don't mind getting dusty and dirty, too.